The challenge: Increase production, while lowering nitrogen emissions, meeting ever-changing environmental regulations and remaining profitable in the face of fluctuating milk prices and rising operating costs. 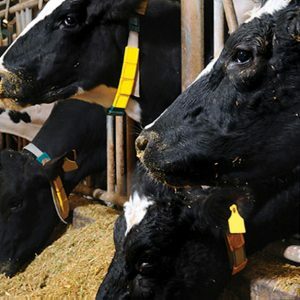 The solution: AminoMax products, plant-based bypass protein sources that blend canola meal and soybean meal to form an amino acid profile specifically for dairy cows. How it works: There is no one-size-fits-all solution because every dairy has its own unique struggles and goals. That’s why AminoMax products give you the flexibility to create customized rations that fit your operation’s individual feeding goals, such as increasing milk components and overall milk quality. Our patented process reduces the amount of crude protein in the diet to increase the energy status of the cow and improve protein efficiency. Feeding more on-farm forage creates rapidly digested starch, which in turn optimizes milk production and decreases expenses. The product’s high feed efficiency helps improve herd economics on your operation and reduces farm odors by lowering nitrogen excretions—ultimately leading to a healthier living environment. AminoMax is also used to feed both fermentable forage and carbohydrates to enhance rumen health and offset short and/or poor-quality forage.